Exceptional eye wear. Exceptional eye care. Your family optometrist, dedicated to exceptional service, quality and care. Windsor Eye Care is a locally-owned optometrist practice with an optical shoppe located in the Buckhead/Sandy Springs area. 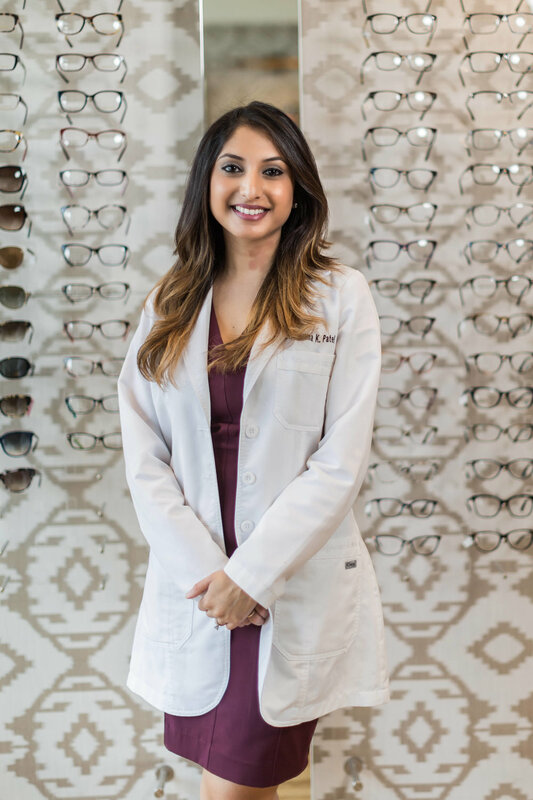 Dr. Gemma Patel is a residency-trained optometrist committed to providing top-notch eye care for the whole family, offering efficient but thorough eye examinations and contact-lens evaluations. With a fashionable and diverse collection of hand-crafted frames and an on-site optical lab, the perfect glasses for every person's style are just one quick visit away. Make an appointment now and join the Windsor Eye Care family. Dr. Gemma Patel was born in England and has lived in the Atlanta area for over 20 years. She is a graduate of the University of Georgia (Go Dawgs!) where she earned her B.S in Biology and Psychology. She continued her professional training in Chicago at the Illinois College of Optometry, completing the doctoral program with honors. During her time as a doctoral student, she was elected to the Beta Sigma Kappa Honor Society. After graduation, Dr. Patel moved back to Atlanta and completed her residency at one of the top surgical groups in Atlanta, receiving advanced training in eye disease and managing post-surgical cases. Patients appreciate Dr. Patel’s thorough eye exams and her warm personality. In her spare time, Dr. Patel enjoys watching Atlanta sports and spending time with her family. Frank was born and raised in the Atlanta area and has been in the eye care industry for over 10 years. Frank is passionate about eyewear and serves as the optician at Windsor Eye Care. He helps patients choose the right frame for their style while also meeting their comfort needs. Frank is also highly skilled in manufacturing glasses in our in-house laboratory. Patients love his contagious smile and down to earth personality. The American Optometric Association recommends yearly eye examinations as an important part of preventative health care. Your eye examination at Windsor Eye Care will involve the use of cutting-edge technology to provide you with the most precise measurements for your eye glass prescriptions. We also utilize digital retinal imaging for early detection of vision-threatening conditions such as glaucoma, macular degeneration and cataracts. The Windsor Eye Care team is proud to provide you with efficient yet thorough eye examinations. Eye examinations are available for the whole family, including children starting at age 3. Whether you are interested in contact lenses or are a veteran contact lens wearer, at Windsor Eye Care we can fulfill all of your contact lens needs. We take the time to ensure your contact lenses provide you with clear and comfortable vision throughout the day. Specialty contact lens evaluations are also available for patients with complex corneal conditions. Windsor Eye Care provides competitive pricing as well as free year-supply shipping to your home. Your overall eye health is very important to us. We perform a thorough check at your routine eye exam but if something pops up along the way, please do not hesitate to call Windsor Eye Care to see our ocular disease residency-trained optometrist. Windsor Eye Care is excited to offer Corneal Reshaping Therapy, also known as Orthokeratology, a non-surgical procedure that eliminates the need for daytime glasses or daytime contact lenses. This revolutionary contact lens fitting involves the use of a gas permeable contact lens to gently reshape your eye while you sleep. Upon awakening, after the lenses are removed, the vision will be clear and sharp throughout the day. This is a safe and effective alternative to laser vision correction for those who are not ready for surgical correction. Book an appointment to see if you are a candidate for Corneal Reshaping Therapy. If you are seeking a surgical solution to eliminate the need for eye glasses and/or contact lenses, come visit us as Windsor Eye Care to determine if you are a candidate for refractive surgery. We provide comprehensive consultations at no cost to you. We collaborate with the top refractive surgeons in Atlanta to ensure you have the best surgical outcome. Are you taking any medications? If yes, please list. Are you allergic to anything? If yes, please list. Have you ever had the following involving your eyes? 1. Payment is due when services are rendered unless other arrangements are made beforehand. 2. Patients are responsible for obtaining all information regarding their insurance. 3. Patients are responsible for any bills not paid by their insurance company after 90 days. 4. If we file insurance, patients authorize insurance benefits to be paid directly to the doctor, and understand they are responsible for non-covered services. 5. Patients are asked to pick up spectacle/contact lens orders in a timely manner. Orders will be returned after 30 days, unless otherwise advised by the patient. 6. Work with a patient's old frame is performed at the patient's own risk. Older frames may break. 7. Contact lens patients - if you wear contact lenses, it is necessary to have a contact lens evaluation. There is an extra fee for this service. I am the guarantor of this account, and I have read, understand, and agree to these office policies. Further, I acknowledge that I am familiar with Windsor Eye Care Privacy Practices.